This post was originally posted in November 2014. 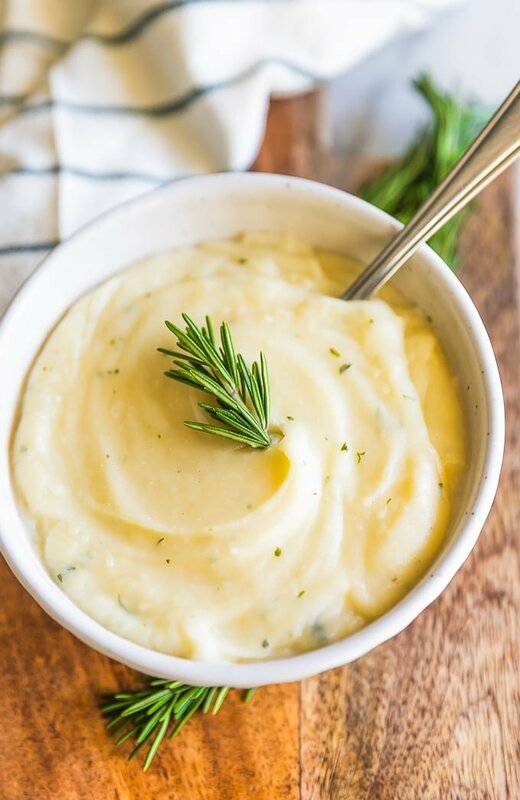 Garlic Mashed Cauliflower is my favorite healthy side dish recipe. When I first started cooking, which as you probably know was NOT long ago, I never imagined I’d be making Mashed Cauliflower someday. I never imagined I’d be making much other than Easy Mac and Lean Cuisine!! Over the past year and a half I’ve found my passion. All of a sudden I’m making Rosemary Garlic Mashed Cauliflower. My how times have changed. What I’ve realized on my journey to learn my way around a kitchen is that cooking is SO MUCH EASIER than I once thought. You can follow a recipe exactly or you can get as creative as you desire. 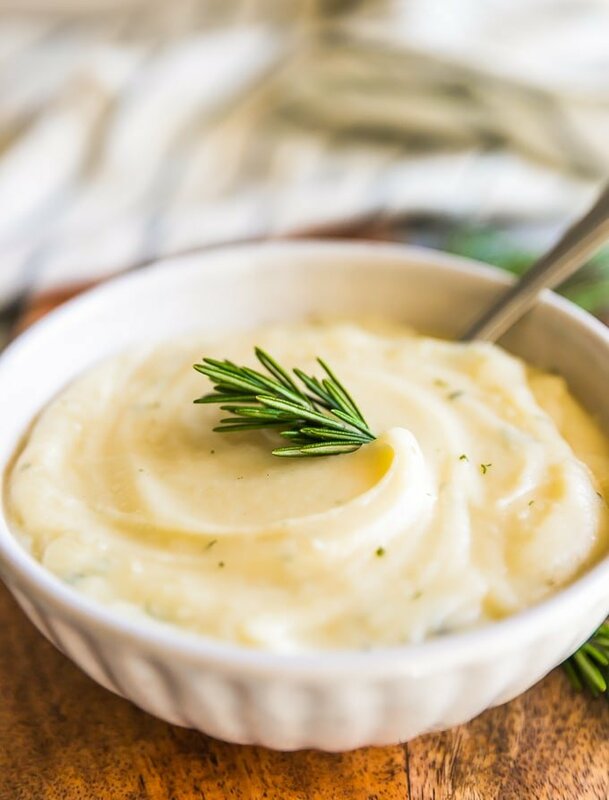 I wasn’t sure if our family would like this mashed cauliflower as much as mashed potatoes, but I have to say we LOVE it…maybe even more. Pat would rather eat this for any holiday. What does Garlic Mashed Cauliflower taste like? 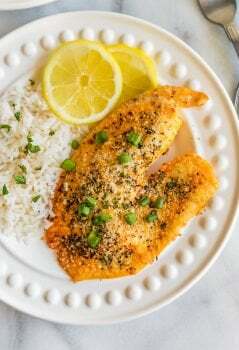 This Mashed Cauliflower Recipe is often compared to mashed potatoes because it’s a similar consistency and paired with similar foods (like our Sheet Pan Chicken Parmesan or Skillet Steak), but it tastes quite a bit different. Cauliflower isn’t the same as a potato. For starters, one is a vegetable and one is a starch! Although different, both taste amazing. I hope you give this Garlic Mashed Cauliflower a try. I was skeptical, I’ll be honest, but this healthy(er) Garlic Mashed Cauliflower was creamy, delicious, and best of all, EASY. This will definitely be making its way to our Thanksgiving table! There will be enough non-healthy items there. I guess I could add just a few less fattening options! What are your favorite healthy holiday side dishes? 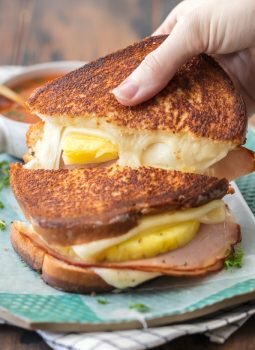 Do you have tweaks you make to classic recipes to make them better for you but just as delicious? I would love to hear your tricks! The more I learn, the more fun it is to try different things. It’s always surprising how even healthier foods can taste just as great! Granted, this still has butter, but we are into baby steps around here! Can I use a blender to make Garlic Mashed Cauliflower? YES! This recipe uses a blender. It helps to make things really smooth. If you prefer a chunkier version you could use a hand blender and not blend it all the way smooth. I love the creamy consistency. Is this Mashed Cauliflower Recipe low carb? FOR SURE! I love that this side dish is a low carb option to add to your holiday table or to any weeknight dinner of the year. I chose to still use butter and cream cheese (although low fat) in these Garlic Mashed Cauliflower. My life view for eating is everything in moderation…so I’m more than fine with a little butter and cream. If you want to make them even lower in calories and healthier, you can sub in greek yogurt or vegan butter. Lots of options to make these your own. 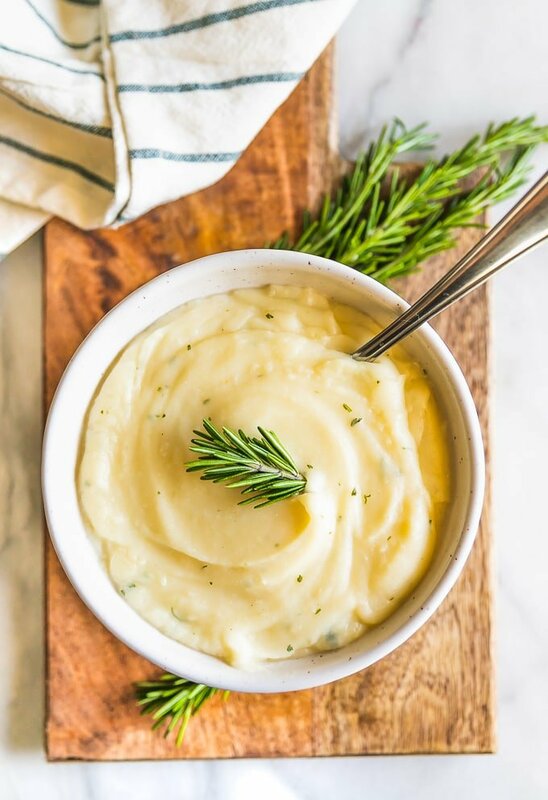 If you’re not sure about Garlic Mashed Cauliflower, we have plenty of mashed potato recipes for you! 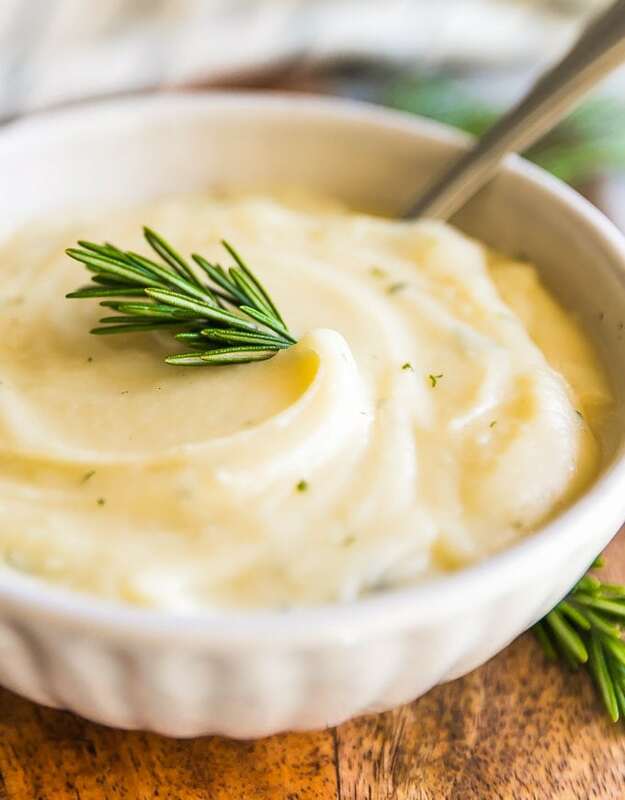 Be sure to try our Make Ahead Mashed Potatoes, Cheesy Mashed Potatoes with Bacon, Garlic Herb Scalloped Potatoes, and of course Garlic Butter Slow Cooker Mashed Potatoes! We also have Deep Fried Loaded Mashed Potatoes Bites. YUM! Be sure to check out some of our other most loved healthy recipes like Grilled Salmon Recipe with Avocado Salsa, Enchilada Stuffed Peppers, and Mediterranean Chicken Burgers. Enjoy! See the recipe card below for full details on How to Make Garlic Mashed Cauliflower. Enjoy! 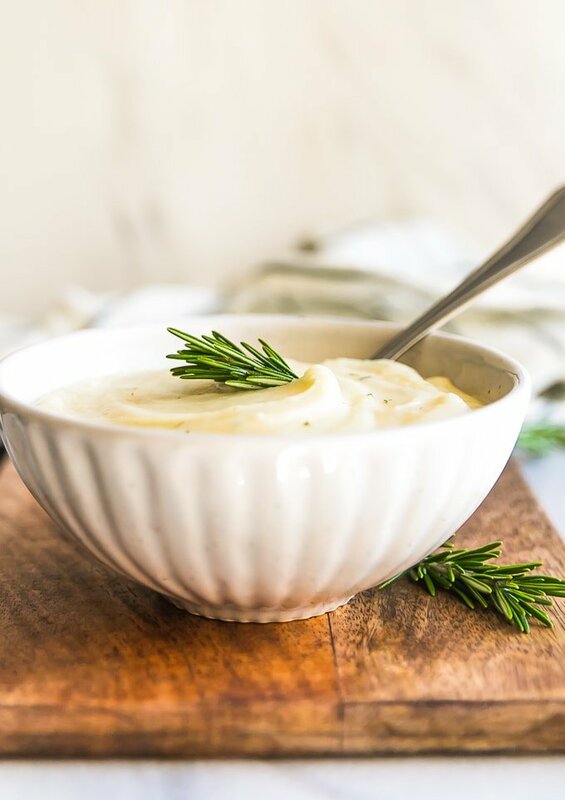 Garlic Mashed Cauliflower Recipe with Rosemary may be healthier, but tastes just as good as Mashed Potatoes! 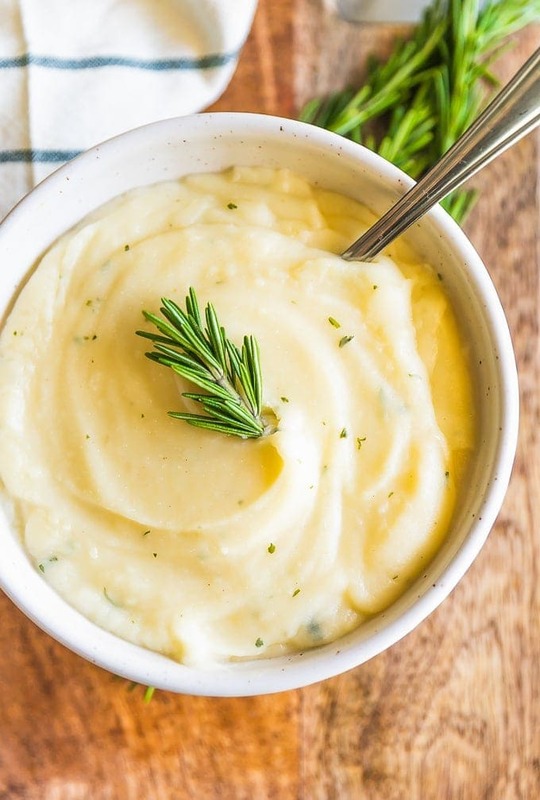 This Mashed Cauliflower is perfect for Thanksgiving, Christmas, Easter, or any day of the year. 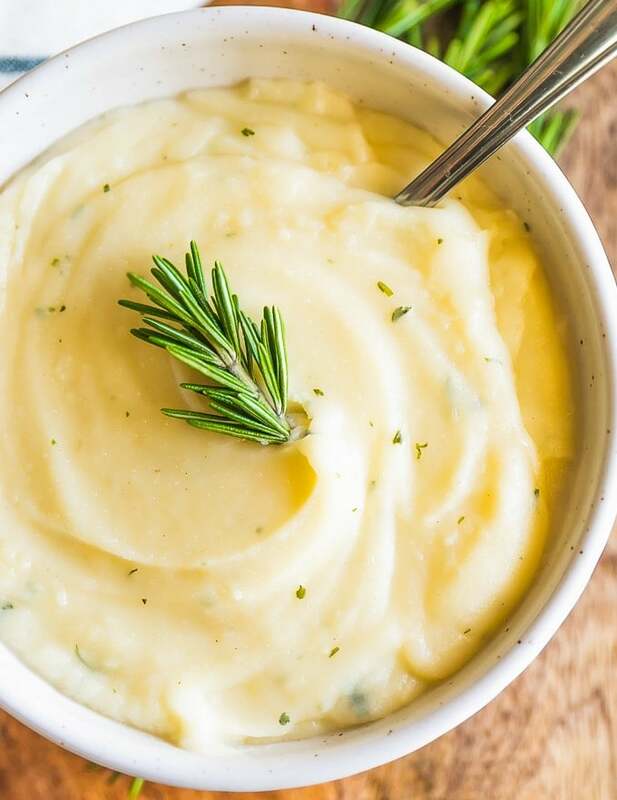 You won't regret making this Garlic Mashed Cauliflower Recipe; missing out on calories and gaining all the flavor! This healthy side dish will be your new favorite recipe. STOP. 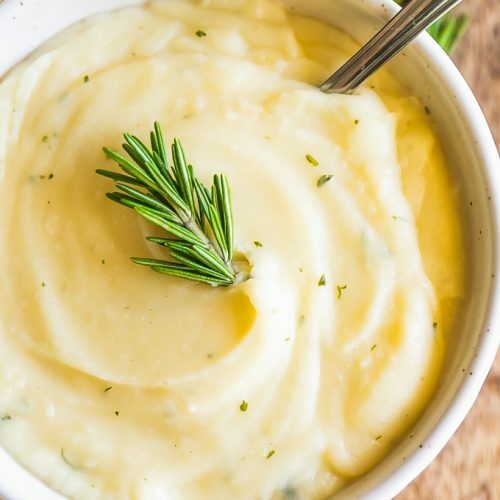 I absolutely adore mashed potatoes but avoid them because they are so dang bad for you! This might be the perfect fix! I agree Kelly! Thanks so much for stopping by, love your site! I’ve really grown to appreciate the versatility of cauliflower- I’ve used it to make “bread” and also in a healthier mac & cheese, but I’ve never had it like this before. I’m definitely looking forward to trying your recipe, it looks so good and such a great alternative to potatoes! The bread and mac and cheese both sound awesome! I had no idea it was that versatile either!! We LOVE mashed cauliflower at our house! This looks delicious! I hope you had a fantastic weekend! Wow, these look so delicious, I’m such a fan of cauliflower…throw some garlic in and omg, I’m soooold! Cauliflower is so awesome, I had no idea! Thanks (as always) for stopping by! I hope we get to hang out again soon! Mine didn’t turn out as fluffy as your pictures (maybe I over puréed) but holy moly that’s freaking delish! I had my mom try some without telling her what it was and she thought it was potatoes. I served it more like a soup and crumbled some bacon on top. That sounds so yummy!!! I might have to try it that way next time! Try subbing chicken broth and sliced almonds instead of cream cheese and boiling in plain water… don’t drain all the broth, use some in the puree process. I love cauliflower and I’m about to try this recipe now, thanks for that! Also, this is very good opportunity to ask: these are very good photos but why on earth, as in so many other food blogs there are photos of same thing just from different angles? One would have been enough. All the best.